As though it were yesterday, I remember sitting at a cramped table in the middle of a crowded Washington, D.C.
restaurant. My newborn rested against my chest in a Snuggi as I held a table and my husband ordered food at the counter. Suddenly, the teenage girls at the table on my right started yelling obscenities at the teenage girls sitting at the table on my left. Then, food started flying. I desperately searched for a way to get my baby out of the brewing rampage, but the place was packed with bodies and tables. Then. . .a knife flew past my ear. My husband said he would never forget the moment. I pulled myself to my full 5’2″ and yelled at the top of my lungs, “HOLD IT!!!!!!!!!!! !” All 15 girls froze. A path magically opened. I walked through and left the girls to their brawl. My baby was safe. When danger looms, parents viscerally react to protect their children. The more dangerous a situation seems, the stronger the response. The mistrust that leads spouses to divorce each other often spills over into mistrust of the other person as parent. 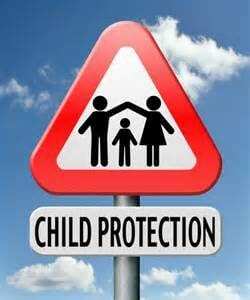 While there are crucial exceptions, generally children do not need protection from their parent. Yet, when we see our children interacting with someone we no longer trust–the protection instinct kicks in. If you feel the need to protect your children, use the following rules to guide your instinctive reaction. These offer real protection all children going through divorce need. Set clear ground rules and stick to them. Abide by drop-off and pick-up times for parenting schedules. Live by the agreements you make regarding homework and extra-curricular activities. Create concrete agreements for how, when, and where new romantic interests will be introduced to children. Be as concrete as you possibly can–in as many areas as you can. This sets expectations and diminishes room for misunderstanding. When parents see each other living up to agreements, the instinct to protect relaxes. STOP FIGHTING. Children don’t value the parent who “fights for them.” Children value the parent who stops the fight. They feel safe with the parent who stops the fight. Find ways to honor the other parent. Of course he/she doesn’t parent like you. Perhaps he/she makes horrible mistakes. Few parents don’t. But, your children know they are a combination of the two of you. Every time you complain about, criticize, or demean the other parent–your child takes every word as a personal rejection. Children don’t feel safe with parents who reject them. Refuse to use your children to punish the other parent. This one is hard. Especially if one parent has fought hard to make the marriage work and is being left by the other. It’s easy to believe that the person leaving should be the person losing. Yet, children are not the rope in tug-of-war. They are not a commodity that you earn. They are people. People who love both parents. People who will never have an ex-mom or an ex-dad. People who need the two of you to work together to ensure their security. Of course the other parent will behave in ways you never would. That’s likely why you’re divorcing. Refuse to see every difference as danger. Instead, focus on what you can control–the time you have with your children. Concentrate on nurturing them, loving them, and engaging with them in the ways you define as best. When you make the most of what you can control, it’s easier to let go of what you can’t. Encourage your children to relate to each of you. This can be particularly hard when one parent has lost all trust in the other. It feels like abandoning children to danger. It goes against every parenting instinct. Yet, children gravitate toward healthy adults. If you are honestly healthier than the other parent, your children will naturally gravitate toward spending more time with you. And, you make it safe for them to do so by refusing to attack a person they love dearly. Even more likely, you’ll find that, as different as you are from their other parent, you each offer crucial elements to your children. If children don’t have to spend their energy defending one parent from the other, they have the space to honestly discern the good and the bad in both parents. As they mature, they learn to take the best from both. The instinct to protect our children looms large. Use the above rules to direct that instinct, and you will be the parent that ensures your children thrive–even in divorce. If you need help knowing how to implement these guides, or with any other aspect of your divorce, call (317-344-9740) or email (info@TheResolutionCenterIndy.com) us at The Resolution Center. We would love to serve you.